This is indeed a special day of joy and gratitude. Sister Elizabeth and Sister Rosanne we, your Benedictine sisters, family, friends and colleagues, praise and thank God for your 75 and 50 years of faithfulness to the Benedictine monastic way of life. We also give thanks for Sister Helen Kilzer who celebrates her 75th jubilee this year, but is unable to with us today. Sister Elizabeth, Sister Helen, Sister Rosanne, and all of us who follow Jesus do receive that hundredfold. God has placed people and opportunities in our lives that never would have happened – had we not followed in the footsteps of Jesus. More importantly we are blessed in Christ’s love. Saint Benedict says, “Prefer nothing to the love of Christ.” Through the monastic lifestyle, we grow in this love. Compared to Christ’s love – nothing else matters. It is only Christ’s love in our hearts that makes us happy and selfless in giving to others. It is Christ’s love that carries us through the joys and sorrows of this life. Thank you, Sister Elizabeth and Sister Rosanne for carrying Jesus’ love in your hearts for so many years and for sharing that love with others. 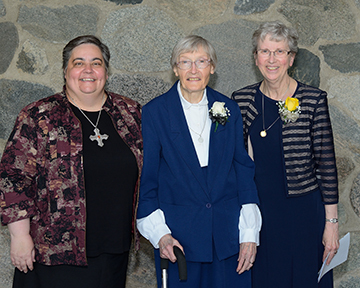 Sister Elizabeth, you and Sister Helen Kilzer are two of our beloved founders of Annunciation Monastery. We are grateful to both of you for volunteering to come to Bismarck from St. Benedict’s Monastery in Minnesota in 1944 to help establish our monastic community. We are grateful for your courage and faith to start a new foundation in the Bismarck Diocese. In your long life as a Benedictine, Sister Elizabeth, you have been a great influence on children and their families through 67 years of teaching, 46 of them in the first grade. You were a teacher in Dickinson, Mott and St. Mary’s Grade School before finally landing at Cathedral Grade School where you taught first grade for 32 years. You taught children to read, write and do math. And you taught them about the love of Jesus. You also have a heart for the poor. You coordinated the plant and craft sale fundraiser with proceeds going to the God’s Child Project and the Bismarck Diocesan African Mission. And at age 83, you even went to Guatemala for a week to work with the children there. In these recent years you continue to give witness to a life of deep faith. You are faithful to community prayer and personal prayer. You are faithful to being present to community events. You have a rich knowledge and experience of living the monastic way of life for 75 years! We have much to learn from you! We are truly blessed by your presence among us. Sister Rosanne, we all know that reaching out to others in service is important to you It is what led you to our community. Throughout the years you have extended yourself again and again to serve the people of the prairies and our monastic community. You currently oversee the financial affairs of our community as you serve as treasurer. You also serve on the board of directors for CHI St. Alexius Health as well as our Monastic Council; just to name a few of or your involvements! For 41 years, you ministered at the University of Mary. We know you spent many hours at the university – giving that ministry your all. We are grateful to you for that. But you are more than a dollars and cents person. You truly listen and care about the people you work with. Often you post prayer requests on our prayer board to pray for someone you worked with or otherwise encountered. But more importantly we are grateful for your faithfulness and dedication to the monastic way of life. You are faithful to the core as a Benedictine monastic woman. You are present to every aspect of our common life. We can count on you to be there for community prayer, Eucharist, our gatherings at meals and always willing to lend assistance where needed. Personal prayer is also important to you. We know you rise very early in the morning to spend time with God. Your faith trickles over in to all areas of your life even- dare I say – the flowerbed in the monastery courtyard. You add beauty to our lives in so many ways. Sister Rosanne, you are a woman with a heart for others. We thank God for the gift you are to us and to all those you come in contact with. 75 years and 50 years is no small matter. All those years ago you promised to live three vows for the rest of your life – stability, obedience and fidelity to the monastic way of life. Stability – You live in love and solidarity with the women of this Benedictine community, persevering in the search for God, cherishing the Rule of St. Benedict, living the traditions and life of this monastery, and serving to further the mission of Jesus. Obedience – You listen attentively to the Spirit present in God’s word, the Rule of Benedict, the prioress, one another, in the Church, and in society. After listening carefully, you respond accordingly. Fidelity to the monastic way of life – You live the Benedictine ideals and life with faithful love believing that you will gradually be transformed and turn ever closer to God. Today you recommit yourself to these same three vows. Sisters Elizabeth and Rosanne, as you renew your monastic profession, we pray for you. We pray that you will continue to remain in Jesus’ love. St. Benedict says, “as you progress in this way of life and in faith, may you run on the path of God’s commandments, your hearts overflowing with the inexpressible delights of love.” May your hearts overflow with love as you continue on the Benedictine way to everlasting life. God bless you and God bless all of us.